The “Asakusa Panda Bus” is free-of-charge shuttle that travels around the Asakusa Area of Tokyo. 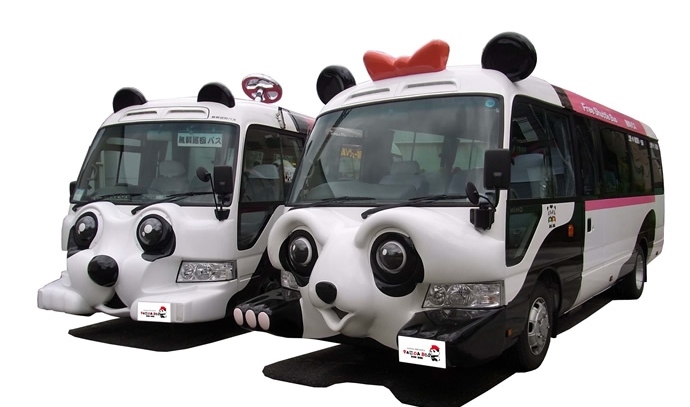 As the name suggests, the bus is designed in cute pandas shape which attracts not only kids, but also tourists from overseas. There are two buses in operation, a “boy” and a “girl,” and both of these buses have eyes that can wink. To add more fun to the sightseeing the seats inside the vehicles are decorated with panda ears. The route, goes through most touristy part of Tokyo and departs from the “Asakusa ROX” commercial complex and then pass the Sumida River Water Bus area, the front of Tokyo Skytree Station, the Yoshimoto Asakusa Kagetsu theater, and the Asakusa Hanayashiki amusement park, etc. The leaflets called “Panda Bus Passports” are provided at each seat and can be taken freely. Those leaflets contain the coupons which make it possible to get discount at famous restaurants at Asakusa Hanayashiki where you can try famous Japanese dish tsukudani – seafood, meat or seaweed that has been simmered in soy sauce and mirin.